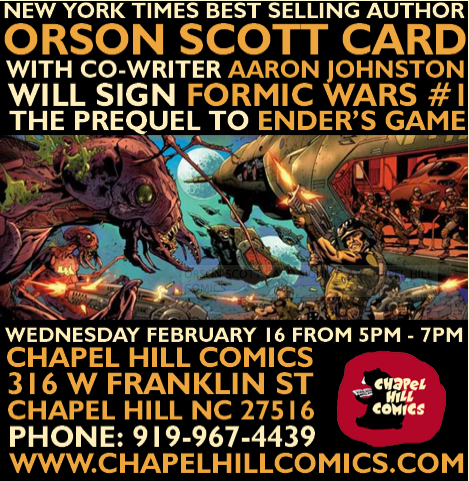 I’ll be doing a signing at Chapel Hill Comics on February 16th from 5 PM to 7 PM with Orson Scott Card. If you’re in the area, come stop by and say hello. It’s the official release party for Formic Wars: Burning Earth #1. Should be fun. Mr. Card will also be signing some of his other works. Incidentally, if you haven’t read Pathfinder, go buy it now. It’s awesome.